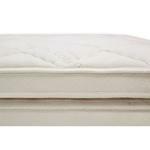 The Quilted Mattress Topper features two layers of luxurious organic cotton fabric with a comfortable layer of PLA batting in the center. PLA is a plant derived fiber made primarily from corn that offers excellent absorption and washability. Meets the strictest GREENGUARD® certification standards for eliminating chemical emissions. 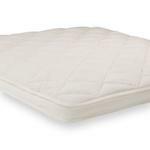 This pad makes an excellent choice for children seeking a more plush sleep surface. Made in the U.S.A.
Two layers of certified organic cotton (top and bottom), and PLA filling for excellent washability. PLA is a 100% plant based fiber made primarily from corn. It performs particularly well after repeated washings while providing a comfortable resiliency. Corner elastic straps hold pad securely in place (latex free). 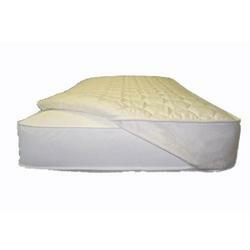 Highly absorptive and extra soft, plus it is machine washable. 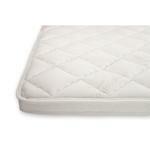 Safe hypoallergenic design free from harmful chemicals. Twin - 38" x 75"
Full - 53" x 75"